DuAll Heating & Cooling provides HVAC maintenance and repair services for businesses in Bolingbrook, Naperville, Plainfield, and Romeoville. We understand that light commercial systems need experienced technicians who are trained to work on the larger, more sophisticated HVAC units that many businesses require. Our goal is to ensure that your employees and customers are comfortable inside your Bolingbrook or Naperville building all year round, regardless of how hot or cold it is outside. And when your equipment is being serviced, you can’t afford to have the day to day operation of your business disrupted. At DuAll Heating & Cooling, we understand what our business clients need – and we deliver. 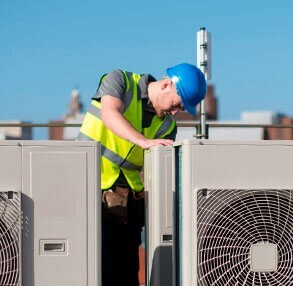 Maintaining the HVAC equipment in your Bolingbrook business in good working condition is the first and most important step in avoiding more costly and disruptive service calls. If you installed the equipment or purchased it with the building, you need to protect your investment and get as much usage from it as possible. Regular service calls for routine tasks such as cleaning, filter changes, lubrication, thermostat adjustments, and pressure tests can keep the equipment operating according to the manufacturer’s specifications. Light commercial HVAC equipment is sturdier than most residential equipment, but that means it’s also more expensive to replace. And just because it’s bigger and tougher doesn’t mean it shouldn’t be regularly serviced. The recommended way to keep your equipment running smoothly and trouble free is to set up a routine maintenance schedule with DuAll Heating & Cooling. Find out why so many businesses in Plainfield and Naperville have turned to us for maintenance of their light commercial HVAC systems. Our certified technicians are trained to repair all types of light commercial HVAC equipment for businesses in Bolingbrook and Naperville. To reduce down time and improve the efficiency of our service calls, DuAll Heating & Cooling’s technicians carry a full range of diagnostic equipment and spare parts on their trucks. We can usually pinpoint the source of the trouble right away, and make a repair that’s durable, safe, and in compliance with all local codes and industry standards. When business owners and managers call for service on their HVAC systems, they want a response that’s reliable and professional. At DuAll Heating & Cooling, we will listen to you to make sure we fully understand the scope of the problem before we start working, and we will make sure any work we do fulfills your expectations. We want to earn your trust and we want the indoor climate in your Plainfield or Bolingbrook business to be comfortable, safe, and clean.